I cut my teaching teeth at a private, Christian school in inner-city Chicago. I found the job posting on a lunch-hour visit to my alma mater, Moody Bible Institute, which happened to be just down the street from the receptionist job I was working at an architectural firm to put my husband through his last semester of undergrad. I hated that job, which was why I found myself staring at the “Teachers Wanted” flyer stabbed haphazardly into the tack-chewed bulletin board. “Huh,” I thought to myself, “I could do that! I mean, how hard could it be? Anything is better than being chained to a desk answering phones all day.” I had a theology degree. I had taken the one required class on Philosophy of Christian Education to graduate. True, I had slept through most of it, tucked comfortably away in the back corner of the lecture hall, but I’d passed, so that’s all that mattered, right? My husband and I were very newly married and living in a cute little apartment in Wrigleyville at the time. He would happily bike to class and I would despairingly trudge to the “El” and sleep-sway with the rest of the commuters to our various low-end jobs. After getting to work the day after seeing the job posting, I took a minute and found the school’s location on the giant map of Chicago that had pins on it wherever the firm’s projects were located. There were no pins even close to it. “Hey,” I asked the nearest architect squinting into his computer screen, “What’s this area like?” He got up and squinted at the map. “That’s the ghetto. Don’t go there.” While I studied the area, he sat back down without another word. I called the school that afternoon. “Do you have a teaching degree and any teaching experience?” was, of course, the first question the principal asked. I couldn’t remember the last time I had even been in the same room with a Jr. High kid. I had no idea how I “got along with them” and I was a theology geek, not a literature and history geek, though I did love to read science fiction and fantasy. “Oh, yes! I’m sure I could do that!” I said. I met the principal the next day after work. I took the “El” to the ghetto and prayed for protection. I didn’t die, which is always a good thing. She hired me after 30 minutes. “Yes, are you ok with that?” she asked. “Well, I should remind you that I’m Canadian,” I said. “Yes, I have a work permit, but I don’t know anything about American History,” I said. Apparently, it was, because before I knew it, I had given notice at the architectural firm, it was Back to School night, and I was throwing up in the bathroom because I was going to be meeting parents whose kids were only six years younger than I was. Parents who were expecting the 8th-grade teacher to prepare their kids for high school. Parents who were trusting me. Only by God’s extraordinary grace (and, I’m convinced, His sense of humor), I pulled it off. The night ended, and they were all still going to send their kids to school the next day. I think about it now, 25 years later, and it still amazes me. I didn’t know then that those parents were desperate. That some of those homes were so ravaged by drugs and gangs and death that the school stood like a beacon of hope and light in the chaos, and the teachers there, who were willing to work for a pittance with no benefits, were like saviors come to give life to their children. They would have taken anyone with a pulse. From Day 1, it was crazy. The kids were slouchy, grumpy, jaded, and hurting. I was a know-nothing white girl, just another teacher using the school as a stepping stone to better things – I’d be gone before they could blink. “Miss Henry, you can’t wear those colors to school! You’re gonna get shot!” We had moved to the ghetto to be closer to the school. We were in the “neutral” territory between two gangs. I’ve never worn black with green again. I can’t count the number of times my heart broke for, and with those kids. But on the flip side, I can’t count the number of times I laughed with them, questioned with them (remember, I was only six years older than they were), and, surprisingly, ate with them – Puerto Ricans make delicious food! It was never about what I was teaching them, although of course, that was important, it was about what God was teaching me, through them. That to teach most effectively, one must love the students and be invested in their souls. Yes, I learned how to make lesson plans, and scope and sequences, and subject goals. I even found that I have a talent for writing curriculum that I still use today. I also learned to love American History – all history in fact – and classic literature. But when I left Chicago to teach 4th and 5th grade at an affluent classical school outside the Beltway in Washington, DC, I left part of me behind. Those Jr. High kids, with their ubiquitous snark and silliness, and unending questions, as well as their increasing cynicism and sadness, quickly found a tender spot in my heart that I didn’t even know was there. 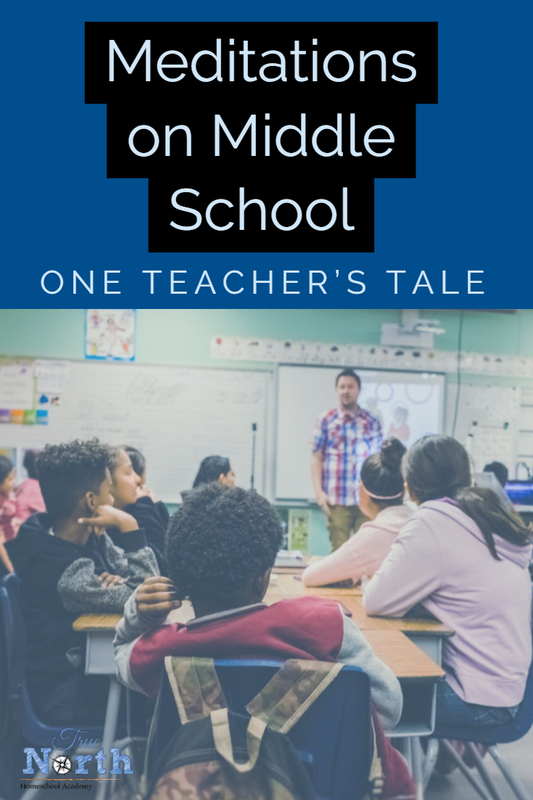 It’s been many years since I first walked into that 8th-grade classroom, and many, many students have sat with me and learned, but those kids have never left my mind. Some of them have been lost to me, swallowed up by the ravenous pit that is inner-city life, but some have sought me out on social media and we have connected again in a new way, though they insist they must still call me “Miss Henry”. Now their children are in school. Now they are meeting the terrified teacher on Back to School Night. Some of them even chose to be teachers. I’d like to hope that I had a small role to play in that decision. Want to know more about Nicole Henry or maybe even sign-up for some of the courses that she pours her heart and soul into? Visit the True North Homeschool Academy blog today for more information! Nicole Henry is the Executive Director of Invictus Classical Press, a start-up company whose mission is to create unique classical curriculum for use by private schools and homeschools. Nicole’s first passion is teaching the Bible, which dovetails nicely with her love of history, geography, art, and literature – she’s a humanities girl through and through! When she’s not writing curriculum, homeschooling, running (or attempting to), and trying to keep her four kids fed, she can be found merrily reading through various books, listening to podcasts about all kinds of things, and teaching herself to draw. Nicole will be teaching 7th and 8th-grade History and 7th and 8th grade Bible this year at True North Homeschool Academy.